PREAMBLE GIRL SCOUTS OF SAN GORGONIO The first Girl Scout troops in the California counties of Riverside and San Bernardino were established in 1922, a mere 10 years after Juliette Gordon Low founded the Girl Scouts of the USA in Savannah, Georgia. Juliette was a charismatic visionary and tireless advocate for girls. At a time when rights for women were severely limited, Juliette fervently believed that girls of all backgrounds and circumstances had limitless capabilities and potential. The first Savannah troops embraced girls from various faiths and even brought together girls from very different economic circumstances. The San Gorgonio Councilâ&#x20AC;&#x2122;s territory is home to one of the most ethnically, culturally, and economically diverse populations in the nation. The Council offers all girls new experiences and opportunities that enrich their lives and opens the world in ways that can lead to a much brighter future. Take for example one Girl Scout signature program â&#x20AC;&#x201C; Cookie Sales. Lessons learned as young entrepreneurs can have a profound and life-long impact. Currently, most female CEOs were Girl Scouts and their first job was selling cookies! Many girls in the San Gorgonio Council come from upper- and middle-class families. However, the majority of the San Gorgonio membership face limitations based on their circumstances at home, such as poverty, educational deprivation and language barriers. These families, in particular, realize significant benefits from their participation in Girl Scouting. The San Gorgonio Council works with all families and adapts Girl Scouting to the diverse population it serves. The San Gorgonio Council has a 27,000 square-mile territory composed of Riverside County and most of San Bernardino County. The Council is headquartered in Redlands, California, and maintains three satellite service centers located in Temecula, Victorville, and Palm Desert. Each office serves as a meeting site for troops and volunteers; a program site for local Girl Scout events; and as a center where Council staff can provide assistance for adult volunteers, girls, and their parents. In addition, the Council operates two camp facilities and five Scout Houses. Camp Wi-Wo-Ca day camp, located in Yucaipa, and Camp Azalea Trails located just outside of Idyllwild. Camp Tautona, in the mountains near Running Springs, is owned by Council but is currently inactive pending renovation and major remodeling. The Councilâ&#x20AC;&#x2122;s five Scout Houses act as localized meeting and programming spaces for area troops. They are located in Banning, Blythe, Hemet, Needles and Perris. SERVICES The San Gorgonio Council partners with volunteers, families, and girls to provide a comprehensive Scouting experience. Girl Scouting helps girls develop their full individual potential; relate to others with understanding, skill, and respect; develop values to guide their actions and provides the foundation for sound decision making; and contribute to the improvement of society through their abilities, leadership skills, and cooperation with others. Programs are age-specific, girl-oriented, culturally diverse, and color neutral. They teach healthy living, financial literacy, teamwork, environmental leadership, and life lessons that instill girls with courage, confidence and character. Topics are relevant to girls today--like body image, bullying, and careers in science, technology, engineering and mathematics. Girls learn to take action when they see injustice and learn to change the conditions around them. THE FUTURE Since the completion of the last Strategic Plan for 2009-2013, the Council has become more fiscally sound, increased and diversified its membership, modified its programming to incorporate Journeys, and become one of the top cookie selling councils in the nation, based on boxes sold per girl. Following the long-range planning for the 2014-2017 Strategic Plan, the Council will continue to be accessible to all girls and focus special attention on recruiting a diversified population of girls in grades K-5 and retaining girls in grades 6-8 to achieve a membership that reflects the diversity of our region. An additional long-term recruitment and retention strategy will focus on low-income communities, by offering scholarships to provide access to the valuable opportunities and life-changing experiences of Girl Scouts. The Council will also focus efforts on the recruitment and support of volunteers; diversification of revenue streams, with less dependency on product sales; and enhanced visibility in the community. The Council will succeed with the collective support of all stakeholders – staff, Board of Directors, volunteers, GSUSA, girls and the families of the girls served, funders, alumnae, educators, and business and political leaders. 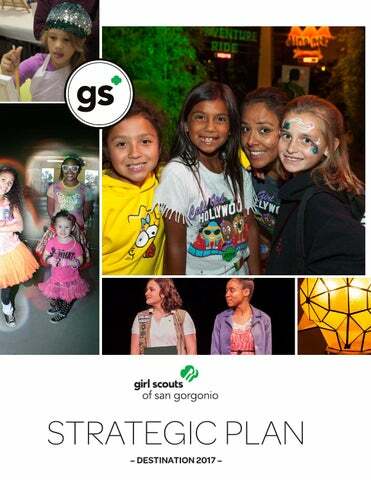 THE 2014-2017 PLAN In January 2013, the Girl Scouts of San Gorgonio began a strategic learning process based on the work of William G. Pietersen, Professor of the Practice of Management at the Columbia University Business School. The process was used to determine the priorities that the Council should adopt and the course of action needed to be successful. This strategic plan clearly states the Council’s customer focus, winning proposition, and the key priorities. Ultimately, this plan will represent a shared vision for all of the Council’s stakeholders. It lays out a concrete course of action to help shape growth over the next four years, and clearly states the outcomes that will be measured to determine the progress of the work. Through the collaborative effort of staff, Board of Directors, volunteers, and community leaders—and thanks to the direction of GSUSA’s outstanding Council Partnership Consultant, Margaret Renwand—the Strategic Plan described in this document was adopted and embraced by the entire Council. GOVERNANCE The Girl Scouts of San Gorgonio Council is a nonprofit 501(c) (3) tax exempt organization. The Council is governed by a volunteer Board of Directors that hires and evaluates the President & Chief Executive Officer, determines the strategic direction of the Council, and assumes fiduciary responsibility for the financial condition of the organization. The President & CEO supervises and directs all staff and approved activities, working in cooperation with the Board Chair and all Board committees to provide organizational leadership. MEMBERSHIP: Increase girl market share, diversity, and adult membership. VOLUNTEERISM: Expand and diversify volunteer opportunities through the development of structures and systems that provide volunteers with valuable, relevant, and transferable skills.  ROGRAMS: Provide valuable opportunities for all girls to participate in the Girl Scout Leadership P Experience through innovative, robust pathways.  UNDING: Build our culture of philanthropy through the creation of sustainable and diverse funding F sources and cultivating new sources of revenue.  OMMUNITY VISIBILITY: Build our community visibility by expanding our media presence in all C markets, partnering with organizations and cultural institutions, and communicating the community impact of Girl Scouts. Insure communications are multi-lingual. Recognizing the uncertainty of the economic markets and the unprecedented discontinuities in this period in our nation’s history, the Strategic Plan embraces the future, but plans for the present. A progression of goals and accompanying initiatives are sequenced into three years to be achieved in each of the five strategic drivers over the planning horizon. Successful completion of each year leads to implementation of the next year. The plan is organized to focus in detail on year one of the strategic initiatives that span the period of 2014-2015. The second and third years are identified – but will be contingent upon multiple factors, including successful achievement of the first-year initiatives, as well as access to funding. In order to achieve our long term strategic vision and the plans for 2016, we must successfully pass through the 2014-2015 portal. The true measurement of success will be the achievement of the quantitative Performance Measurements and Metrics. To maintain focus and discipline, monitoring the progress in achieving these quantitative goals will be checked on a quarterly basis. This document and the pages that follow have been prepared to integrate the thinking of staff, board and key external stakeholders regarding the prioritization of strategies for the Girl Scouts of San Gorgonio Council over the next 4 years. It is presented in a summary fashion and format. The fundamental building blocks of the organization – its mission, vision, values and beliefs – are presented first. These statements provide a critical context and filter for the strategic plan. As San Gorgonio begins its strategic journey of diversifying and elevating the agency to a new plateau, it will stay true in all respects to its mission, vision, values and beliefs. PROMISE ON MY HONOR, I WILL TRY: TO SERVE GOD* AND MY COUNTRY, TO HELP PEOPLE AT ALL TIMES, AND TO LIVE BY THE GIRL SCOUT LAW. *When saying the Girl Scout Promise, each individual may substitute the word that best expresses his/her spiritual beliefs. LAW I WILL DO MY BEST TO BE HONEST AND FAIR, FRIENDLY AND HELPFUL, CONSIDERATE AND CARING, COURAGEOUS AND STRONG, AND RESPONSIBLE FOR WHAT I SAY AND DO, AND TO RESPECT MYSELF AND OTHERS, RESPECT AUTHORITY, USE RESOURCES WISELY, MAKE THE WORLD A BETTER PLACE, AND BE A SISTER TO EVERY GIRL SCOUT. The Girl Scout Promise and Law are shared by every member of Girl Scouting. The Girl Scout Promise is the way Girl Scouts agree to act every day toward one another and other people; the Law outlines a way to act towards one another and the world. GUIDING PRINCIPLES We believe the Girl Scout Promise defines who we are and is the cornerstone of our Movement. We work to ensure our Movement is open to all girls and adults who accept the Girl Scout Promise and satisfy the membership requirements. We believe girls learn by doing and that they learn best in a safe, positive environment. We believe adults partner with girls to guide and inspire growth and achievement, and that these partnerships are essential to the strength and capacity of our Movement. We are community partners, take a leadership role in the community, and believe in the core human virtue of service, in taking action, and in making a difference in the world around us. We are committed to advancing diversity and pluralism in our Movement and in the communities in which we live. We hold that the ultimate responsibility for the Girl Scout Movement rests with its members, and we govern by a decisive and nimble democratic process that demonstrates our leadership in response to a fast-changing world. We are a premier voice for girls, give voice to them, and are experts in their growth and development. Yucaipa, was gifted to the Redlands Council by the Hunts Family. The property is still in operation and is used for retreats, weekend camping by troops, and San Gorgonio’s summer day camps. In the 1950s and 1960s, the city-based councils began to combine into area councils. In 1958, Riverside Council changed its name to “DeAnza Council” and San Bernardino Council became “Tautona Council.” The Redlands Council, which included Redlands, Yucaipa, Oak Glen, Calimesa, East Highland, Forest Falls, Mentone and Mill Creek Canyon, changed its name to “San Gorgonio Council” in 1961. At that time, the five Councils (Fontana, San Gorgonio, DeAnza, Palo Verde and Tautona) which are now all included in GSSGC had a total girl membership of 10,912. In 1965, Palo Verde Council merged with DeAnza Council. In 1968, DeAnza, Fontana and Tautona Councils merged into San Gorgonio Girl Scout Council. The next year, on January 27, 1969, the San Gorgonio Council received their official 501 (c) (3) designation. 1. IT’S YOUR WORLD – CHANGE IT 2. IT’S YOUR PLANET – LOVE IT 3. IT’S YOUR STORY – TELL IT. Each of the three Journeys covers the following topics: advocacy, environmental awareness, and self-esteem. 1. DAISIES (K-1) 2. BROWNIES (2-3) 3. JUNIORS (4-5) 4. CADETTES (6-8) 5. SENIORS (9-10) 6. AMBASSADORS, (11-12) Every Journey contains activities that embrace the keys to leadership development: Discover, Connect, and Take Action. Each of these three keys to leadership has five measureable outcomes, or intended benefits. These outcomes are measured via indicators that are specific, measurable observations to determine achievement. Not only does each activity incorporate one or all the keys to leadership, but it also emphasizes the Girl Scout processes involved: girl led (decision making and involvement), learning by doing (hands-on action and reflection) and cooperative learning (collaboration and sharing of ideas, knowledge, and skills). There are five badges associated with each Journey for each age level. At any point in a Journey, girls can create their own criteria and badge, following national guidelines that incorporate the keys to leadership, one or more outcomes, and the Girl Scout processes. Each Journey culminates in a Take Action Project. A Take Action Project is a project that makes a positive difference in a girl’s world, her community, or globally; is measurable; and is sustainable after implementation. Similarly, a separate Take Action Project can be conceived, designed and implemented to earn a Bronze, Silver, or Gold Award, depending on age level. The Girl Scout Leadership Experience creates a new kind of leader that values diversity, inclusion and service, and utilizes Take Action Projects to improve a girl’s world, her community, or globally. OUTCOMES GSLE is designed to connect to one or more of the 15 national leadership outcomes. The outcomes are intended benefits that validly measure the impact of the experience. There are five outcomes for each key to leadership. The first set, that represents “discover,” is a sense of self, positive values, practical life skills, seek challenges, and critical thinking. The second set, that represents “connect,” is healthy relationships, cooperation and team building, conflict resolution, advancing diversity, and connecting to the local and global communities. The third set, that represents “take action,” is identify community needs, resourceful problem solving, educate and inspire others to action, and empowerment to make a difference. AWARDS The Girl Scout higher awards begin at the Junior level (4th-5th grade) with the Bronze Award Take Action Project, progressing through Cadettes (6th-8th) with the Silver Award Take Action Project, and ending with the highest girl earned award, the Gold Award Take Action Project for Seniors and Ambassadors (9th-12th). The higher award Take Action Projects differ from the Journey Take Action Projects. A Journey guides them through the Project to match the theme of the Journey, while the Take Action Projects for the higher awards allow the girls to explore their community and address the root causes of an issue, to enable girls to come up with sustainable and impactful solutions. For each award age level, the autonomy of the Take Action Project increases. The Bronze Award is traditionally done as a troop; the Silver Award is completed either as a troop or by small groups within the troop and, the Gold Award is completed individually. Any of these awards can also be done individually, whether the girl is in a troop or is an Individually Registered Girl. MEMBERSHIP, VOLUNTEERS AND PROGRAMS MEMBERSHIP Girl Scouts of San Gorgonio Council is a volunteer-driven organization. The Membership Department is responsible for the recruitment and retention of girl scouts and adult volunteers. The ”membership year” runs from October 1 through September 30, during which time representatives from the Membership Department introduce the benefits and excitement Girl Scouting can offer to girls, their parents, adult volunteers, and to the entire community. There are many ways that a girl can become a registered member of Girl Scouts. Girls can enter in through the traditional troop setting, attending regular meetings and events with their troop. Girls who have not been placed in a troop can join Super Troops. Super Troops are multi-level troops, where girls can begin benefiting from the Scouting experience while waiting to be placed in their own troop. However, a girl does not need to be in a troop to enjoy the Scouting experience Juliettes are individually registered Girl Scouts, not connected to a troop or Super Troop. The Juliette Program is designed for girls who live too far from the nearest traditional troop, or those who are waiting to be placed into a troop. Juliettes are able to participate in all the Pathways, Product Sales, and all regional and Council events. The benefit of the Juliette Program is that the Girl Scouting experience is determined by the girl and her family. Recruitment is a year-round process. It begins by educating the community about the benefits the Girl Scouting experience can have on a girl’s life and making these communities aware that Girl Scouts is available to all girls. The objectives of the Membership Department are achieved by distributing Girl Scout flyers and contact information at local schools and community centers; holding parent meetings at local centers; being present at community events; offering Series Pathway Programs; providing the option of staff-led troops (i.e., Super Troops); and supporting local agencies, such as community resource centers, in hosting a troop. The Membership staff works with parents and volunteers in supporting their efforts to bring the Girl Scouting experience to their daughters and troops. Staff is available to answer questions, guide parents and volunteers through the registration process, and provide direct contact for further support in regards to their membership. The Membership staff recruits, mentors, and conducts membership and registration training sessions for new leaders and volunteers; oversees troop and regional meetings to provide guidance and support; and enhances the visibility of Girl Scouts in the communities served by the San Gorgonio Council. The Membership Department is composed of a culturally diverse, multilingual staff, which is knowledgeable and available to answer any questions girls, parents, and volunteers may have. The current outlook of membership is bright. Membership increased 22% from 2011 to 2013, and the final membership numbers for the 2013 membership year were 11,669 girls and 5,583 adults. Additionally, the Council’s market share increased over the last three years to 3.19%. (It was 2.7% in 2011 and 2.94% in 2012). The San Gorgonio Council ended the 2013 membership year with 926 troops, 29 Super Troops, and over 1,500 girls and adults registered as Juliettes. PROGRAM PATHWAYS There are many distinct ways girls and adults can participate in Girl Scouting. The Pathways offer a variety of opportunities for girls and their families to choose how they want to participate in Girl Scouting. The Troop Pathway is the traditional way girls and adults get involved in Girl Scouting. A Girl Scout troop consists of at least two non-related volunteer troop leaders and at least five girls. Troops meet together regularly (meeting frequency is determined by the troop members), usually for the duration of the school year. Troops provide an opportunity for girls to Discover, Connect, and Take Action. These key elements are introduced through a variety of activities including Council or regional events, troop trips, product sales, badge work, community service and so much more. The Series Pathway offers activities for a group of participating girls, scheduled over 4 to 6 sessions, relating to a specific theme or purpose. Series are thematic in nature, may be Journey based, and support the Council’s program initiatives in the areas of STEM, Healthy Living, Environmental, and more. The Series Pathway constitutes an effective way to introduce Girl Scouting to communities unfamiliar with the Girl Scout Movement, and offers the potential to transition participants into the Troop Pathway. For example: Be a Friend First – anti-bullying program for middle school aged girls; Hermanas with One voice for Personal Empowerment (HOPE) – self-expression through the arts program for middle school aged girls, and Discover Girl Scouts which introduces the Girl Scout Leadership Experience to elementary school aged girls. Series are developed with the intent that each registered participant attends all sessions scheduled throughout the course of the offering, because sessions are designed so that each one builds towards the next and culminates upon the delivery of the last session activity. The Events Pathway consists of participation in some of the scores of events that the San Gorgonio Council hosts for girls throughout the regions. Most events are organized by regional volunteers and offered to girls specifically in their regions. Other events are planned by Council staff and offered to all girls and adults throughout the five regions. The events are developed to take into consideration the interests of the girls and the roles the events play in developing leadership qualities. In the 2013 membership year, there were 77 regional events held with 7,354 participants attending. For the past four years, the largest Council-wide event has been the Believe in Girls Expo, which was last held on January 11, 2014. It had 4,211 attendees. In response to volunteers’ request to bring more events to their regions and devote less time and resources to a single large annual event, the Believe in Girls Expo has been suspended for the immediate future. Girls can participate in the Camp Pathway individually, with friends, or with a parent. In 2013, the Girl Scouts of San Gorgonio Council served almost 1,000 girls through the volunteer and staff led camp programs. All camp programs are offered either at the Councilâ&#x20AC;&#x2122;s camp properties (Camp Wi-Wo-Ca or Camp Azalea Trails), or at local community centers and facilities centrally located to serve girls in that region. The Travel Pathway encourages girls to experience the world and cultures different from their own. Girl Scouts have the opportunity to engage in domestic or international travel, either as individuals, with their families, with their troops, on Council-sponsored trips, or trips organized by the Girl Scouts of the USA. Girls can acquire many skills in the days leading up to their trip. In the planning process, girls learn the importance of planning for a trip, preparing for travel, and raising the funds necessary for their trip through saving and fundraising. With the help of their parents and Girl Scout volunteers, a girl will be assisted with her planning, while still demonstrating the initiative and responsibility required to prepare for her trip. In the past year, the Girl Scouts of San Gorgonio Council hosted a trip to Costa Rica in July (6 girls and 2 adults attended; 1 girl and 2 adults were from GSSGC) and a trip to India in late December (22 girls and 6 adults attended; 4 adults were from GSSGC). Additionally, there were 34 troops that did Extended Troop Trips (E.T.T.) to various locations: Catalina, Costa Rica, Grand Canyon, Hawaii, Las Vegas, New York, San Diego, San Francisco, Washington DC, Yosemite, and Zion Park. In total, 243 girls and 141 adults participated in E.T.T. 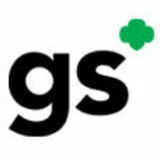 Through the Virtual Pathway, girls are able to connect with other Girls Scouts throughout the San Gorgonio Council, across the nation, or even with Girl Scouts and Girl Guides internationally through their PC, tablet, or other data device. The Virtual Pathway is an online Girl Scout community that provides girls with the opportunity to participate in Girl Scouting, despite geographic location. Girl Scouts and volunteers can use this Pathway to share their interests, organize activities, and participate in online programming. Currently the Girl Scouts of San Gorgonio Council does not offer any programming for the Virtual Pathway. Council staff is developing programming that will connect girls, parents, and adults within the Council and around the globe. Multiple trainings are provided throughout the year to support new and existing leaders. Some of the more frequently offered trainings to our new leaders and volunteers are: Basic Leadership Training, Basic Outdoor Training, First-Aid/CPR, and Extended Troop Travel. These training sessions provide opportunities for adults to learn more about their volunteer positions, about keeping others safe, and become better prepared for their roles in the Council. Trainings are also provided by the Product Sales Department for the Fall Product and Cookie Sales. Trainings are provided in all the San Gorgonio regions, either in Council offices or at an off-site location to conveniently accommodate participants. In 2013, 1,971 girls and adults attended training sessions offered by the Council. PRODUCT SALES Participating in the Girl Scout Product Sales Program provides girls of all ages with a leadership experience that helps them build skills they will use today and tomorrow. The Cookie Sale began more than 80 years ago as a way for Girl Scouts to be self reliant and to fund their own activities. That purpose is no different today. As the largest girl-led business in the country, the Girl Scout Cookie Program is a unique opportunity for girls to become leaders in their own lives and in the wider world. The nuts and candy sale (the Fall Sale) came along many years after the Cookie Sale, but it has become the start-up business for Girl Scouts that prepares them for the larger, fast-paced Cookie Sale. THROUGH PARTICIPATION IN THE PRODUCTS PROGRAM, GIRLS DEVELOP FIVE SKILLS THAT LAST A LIFETIME: 1. GOAL SETTING: girls learn how to set and reach goals--a skill that will extend beyond the number of nuts, candies or cookies sold. 2. DECISION MAKING: when they encounter a problem, girls learn to consider all the options available to them, weigh the possible outcomes, make their own decisions, and evaluate the results. 3. MONEY MANAGEMENT: girls learn proper cash handling skills, as well as budgeting, spending, and saving. 4. PEOPLE SKILLS: the Product Sales Programs provide the perfect environment to learn how to interact with customers and develop social skills. 5. BUSINESS ETHICS: the Products Sales Programs teach girls honesty, responsibility and integrity. GSSGC takes the Product Sales programs a step further, beyond the five key skills, and incorporates self-esteem. The San Gorgonio Council created the “Whole Girl Program,” or what is referred to as “Sparkle.” This idea instills the belief in oneself through the Products Sales Programs: that a girl who believes in herself and in the words “I Can,” is a girl who can succeed at whatever she sets her mind to achieve. This is an important addition to the five key skills of our products program. The Product Sales Programs are instrumental in key foundational skills for the Girl Scouts and they also constitute the largest source of revenue within the Council. With 84% of all cash flow streaming directly from the Product Sales Department, the department’s mission within the Council is a vital one. The Product Sales Department creates exciting new ways to engage our girls and reward them for their determination and hard work. With rewards that are experience-driven, technology-rich, and priceless for their life-time memories, the Council has been able to increase its Cookie Sale revenue by nearly 70% over the past four years. In addition to the programming component and sales insight the girls acquire, the Council is proud to have a thriving “I Care” program that annually partners with active military, veterans hospitals, homeless shelters, food banks and other local community agencies to distribute donated cookies. This act of philanthropy is the culmination of many hands doing good work. The Product Sales Programs truly provide experiences that affect the “whole girl” --her head for business, her empathetic heart, her self esteem driven soul-- all from a can of nuts and a box of cookies. RESEARCH AND EVALUATION San Gorgonio Council conducts evaluation of programs and initiatives through audience feedback, pre- and postsurveys and narrative reports. Program development is guided by this original research and by the data provided by The Girl Scout Research Institute (GSRI). Formed in 2000, the GSRI conducts original research, evaluation, and outcomes measurement studies; releases critical facts and findings; and provides resources essential for the advancement of the well-being and safety of girls living in today’s world. The GSRI also informs program, public policy, and advocacy for Girl Scouting. The GSRI looks at a girl’s development through many different aspects, including financial literacy; girl leadership, beliefs, and values; girls and media; healthy living; the effects of science, technology, engineering, and mathematics (STEM); and volunteerism. Results from the GSRI are provided to each Girl Scout council and are publicly accessible to the general public. FUND DEVELOPMENT, EXTERNAL RELATIONS, AND MARKETING FUND DEVELOPMENT The Girl Scouts of San Gorgonio Council has initiated projects in several focus areas that tie to the Strategic Learning recommendations and that are designed to achieve desired diversification of revenue sources. A concerted effort is underway to identify individuals with the means and the interest to become major donors to the San Gorgonio Council. A major donor is defined as one that gives at a level of $1,000 per year or more. Sources for major donors that are being mined include a wide range of community, business and political leaders; members of the Alumnae Association; Girl Scout volunteers and registered adults. This program encourages donors to consider a bequest to the San Gorgonio Council. Girl Scouts of the USA has excellent resources to help the Council implement this program. In addition, Reita Dykes—a former Board member and a Girl Scout for 75 years—has pledged a substantial bequest that constitutes a “lead gift” in this campaign. The Inland Empire is one of the most challenging regions in the country for grant seekers. GSSGC will expand its efforts to apply for funding from companies and foundations headquartered, or with a presence, in the Inland Empire. One specific area that will be addressed is establishing relationships with the various American Indian tribes in our Council area, in hopes of partnering with them. We are also approaching larger foundations in Greater Los Angeles to become interested in supporting the Inland Empire and the San Gorgonio Council in particular. The Board members, GSSGC employees, and employees of businesses that have employee giving programs are encouraged to choose GSSGC as a personal charity. The Council will produce one or more major, Council-wide fundraising events annually. The San Gorgonio Council has not staged a successful fundraising event in at least five years, so these events will require research, careful planning and excellent execution. The Girl Scouts of San Gorgonio Council has been at a fundraising disadvantage for many years, due to the absence of a donor management system. Raiser’s Edge, an enterprise software application designed to integrate with Financial Edge, has been installed and is currently being implemented. The database of donors has been populated, including details about donor giving. The next step is the ongoing addition of potential donors to whom the Council can appeal for support. With diligent maintenance of donor records, Raiser’s Edge will be a powerful fundraising tool. EXTERNAL RELATIONS Fundraising goes hand-in-hand with achieving greater visibility. This area includes public relations, work with the media, crisis management, social media and diversity. The purpose is to raise the image and visibility of Girl Scouts and the San Gorgonio Council in the community, by providing messaging to board members, staff members, and volunteers that have the opportunity to interact with community leaders; and to prepare stories and press releases for placement with various media outlets, including the press, radio and television. In the event of a controversy or an incident that might reflect poorly on the San Gorgonio Council, manage the story and communications from Council so that GSSGC’s position is one of honesty and transparency. The San Gorgonio Council maintains a robust social media presence, with over 4,000 “likes” on the Council Facebook page and extensive Twitter messaging. A dedicated staff member monitors Facebook, manages online discussions, tweets on behalf of Council, and ensures that this powerful communication tool for Council, volunteers, and girls remains a positive source of messaging for the Council. This initiative involves re-engaging former Girl Scouts in the activities of the San Gorgonio Council. In less than a year, more than one thousand people have registered as alumnae and associated themselves with the San Gorgonio Council. Many alumnae simply want to stay connected and receive information about the Council, but a significant number represent a powerful potential source of gifts and volunteer expertise. A comprehensive recruiting effort will continue to grow the Association. Starting with the staff, training and awareness exercises have been conducted (and continue to be held) that encourage San Gorgonio staff members to recognize the strength in diversity and celebrate the differences among people. The Council will continue efforts to recruit staff members, volunteers, girls and Board members that mirror the diversity within the population served by the Council. One fulltime and one part-time graphic artist designs brochures, flyers, magazines, banners, patches and other collateral materials in support of programs, membership, events and product sales. Production of materials, including printing, is managed by the artists. A total redesign of the GSSGC website was delivered at the beginning of FY2014. The site is updated on a daily basis to keep all content current. Parts are redesigned as necessary to improve navigation and usability. GSSGC ensures appropriate use of the Girl Scout logos and trademarks, monitors communication to prevent abuse of the Girl Scout brand, and implements the guidelines from Girl Scouts USA for use of the brand. FINANCE OPERATING INCOME The Girl Scouts of San Gorgonio is a Californian non-profit corporation, which entitles the organization to a tax-exempt status under 501(c)(3) of the Internal Revenue Code. During the last three years, the average total operating income was $4.64 million. The current fundraising focus for operational income is to further diversify revenue streams through strengthening giving categories for individuals, corporations and foundations. OPERATING EXPENSES The average total operating expense for the last three years was $4.64 million, of which program expenses average 86%. GOVERNANCE The San Gorgonio Council traces its inception to 90 years ago when the first Girl Scout troops were formed in Riverside and San Bernardino counties. Membership grew quickly and it was soon evident that local governing bodies were needed to ensure compliance with National policies and procedures. The Girl Scout of San Gorgonio Council received 501(c) (3) determination on January 27, 1969. The founding documents ensured unification of local governance into one Board of Directors for the new Council. The 25-founding members of the Board of Directors were elected by delegates representing the entire San Gorgonio membership at the Annual Meeting. Candidates were recruited from among community and business leaders with Girl Scout experience. The first President of the original Board of Directors was Ann Corison. Today, the Board of Directors for the Girl Scouts of San Gorgonio Council is composed of 17 diverse individuals representing the Councilâ&#x20AC;&#x2122;s five regions. Elections are still voted upon at the Annual Meeting by delegates from the whole membership. The Board consists of men and women specifically recruited because of their integrity, passion for Girl Scouting and ability to further the goals of the Movement. Each member represents a needed skill, talent or areas of expertise and all have excellent community reach. The Board of Directors concentrates its efforts on garnering support from the business community, private foundations, corporations, school districts, political leaders and social service agencies. The Board of Directors is organized into committees: Board Development, Finance, Properties, Fund Development and Audits. The current Board structure includes a Chair, First Vice-Chair, Second Vice-Chair, Treasurer, Secretary, and standing committee chairs (listed above). Additional committee and taskforce efforts are convened as needed for topics such as Summer Camps, Marketing, Compensation, Bylaws, Earned Income or Special Events. The members of the Board bring invaluable expertise and knowledge that is critical for the governing body of the Council. The San Gorgonio Board of Directors is essential in overseeing the governance of the Council and making the key strategic decisions that help direct the Councilâ&#x20AC;&#x2122;s long-term goals. COMMUNITY PROFILE REGIONS Girl Scouts of San Gorgonio Council (GSSGC) encompasses over 27,000 square miles within its jurisdiction, making it one of the geographically largest councils in the nation. This California-based council includes the entire Riverside County and most of San Bernardino, with the exception of the northeast corner. The San Gorgonio Council is divided into five regions, served by four service centers located in Redlands (Central and Central West), Temecula, Palm Desert, and Victorville. The five regions of the San Gorgonio Council and the surrounding major cities are High Desert, Central, Central West, Southwest, and Low Desert. SOCIAL DYNAMICS GSSGC offers many opportunities and learning experiences to girls and their families--experiences that are not accessible to these girls without Girl Scout programming. GSSGC creates an all-inclusive environment, where girls can have a unified and meaningful experience regardless of their ethnicity, culture, socioeconomic status, or community location. Within Riverside and San Bernardino counties there are many factors that make the San Gorgonio Council one of the most diverse Girl Scout councils in the nation, and San Gorgonio is committed to creating an experience that adapts to all demographics while providing the same opportunities equally to all girls. According to the 2010 US Census, the Riverside and San Bernardino Counties were two of the fastest growing counties in California. From 2000 to 2010 the population in Riverside County increased to 2.19 million residents with a growth rate of 41.7%, while in San Bernardino County the population increased 19.1% to 2.04 million. Current estimated population totals according to the U.S. Census are 2,268,783 for Riverside County and 2,081,393 for San Bernardino County. While San Gorgonio Councilâ&#x20AC;&#x2122;s market share (those served compared to the overall girl population) is only 3.1%, membership has increased 22% over the past two years. By expanding outreach throughout each of the regions, in communities where Girl Scouting was once unavailable, the Council will continue to expand its reach to all girls who want to experience Scouting. The San Gorgonio Council is focused on serving all girls, regardless of race or ethnicity. The Council is progressing toward its goal of a membership that is a direct reflection of the communities it serves. GSSGC is tailoring programs and services to accommodate all cultures by offering multilingual programming. The Council is also focused on providing the full Girl Scout experience to high-poverty girls and their families. EDUCATION The California Department of Education reports 58 school districts within Riverside and San Bernardino counties, with a total enrollment of over 838,000 students. Girl Scouts compliments girlsâ&#x20AC;&#x2122; school education to help them develop into well-rounded leaders of tomorrow. Girl Scouts gives girls unique and purposeful learning experiences, such as camping, outdoors activities, financial literacy, project management, business management and social skills. Girl Scouting has been proven to help girls become better students and achieve greater academic success. Involvement in Girl Scouting teaches girls the skills to become better students, and keep them engaged in their goals and focused on their aspirations for the future. Girl Scouts keeps girls in school and encourages them to make good choices when facing the temptations of adolescence. According to the California Department of Education, the Riverside and San Bernardino counties report that female dropout rates from high school were 8.8% and 10% respectively. These rates were proportionality higher for Hispanic and African-American students. Girls who are involved in Girl Scouting are more likely to have increased academic success, graduate from high school, and be better prepared for their futures, according to the Girl Scout Research Institute. ECONOMY	The effects of the 2008 recession on Riverside and San Bernardino counties have been severe. Many families are still struggling with the impact. Thousands of families have lost their homes to foreclosure, parents have been laid off from work, and working families are struggling to survive with cuts in both wages and working hours. For many families, both parents need to work and in other households parents are working more than one job to support their families. According to the US Department of Commerce, the per capita incomes for the Nation and for California were $29,551 and $28,051, respectively. The per capita incomes for Riverside and San Bernardino counties were $23,863 and $21,636. The outlook for the economy in Riverside and San Bernardino counties is somewhat positive, and shows modest signs of recovery from the 2008 recession. The unemployment rate in the two counties has steadily dropped each month, according to the US Bureau of Labor Statistics; the housing market has stabilized; and consumer spending has improved. The challenging economic climate certainly has had an influence on the families that Girl Scouts of San Gorgonio Council serves. Fewer families are able to participate in Girl Scouts than a decade ago due to financial restrictions and time constraints. Fewer girls are able to participate, because there are fewer adults that can volunteer to be troop leaders. There are not enough troops and that results in fewer membership opportunities for girls. Too many newly registered Girl Scouts are placed on waiting lists, pending recruitment of more adult volunteers and the formation of new troops. San Gorgonio Council has accommodated for the changes in the economy and family dynamics, by fashioning programs that fit familiesâ&#x20AC;&#x2122; limited schedules and by offering financial assistance to families in need. Financial assistance is invaluable to cover membership costs, basic uniform items, and Journey workbooks for girlsâ&#x20AC;&#x2122; activities. A concern within the two counties of the San Gorgonio Council is the substantial increase in poverty, particularly among children. According to the Public Policy Institute of California, nearly one in five California residents and one in three children in Riverside and San Bernardino Counties are living in poverty. These conditions are attributable to the economic downturn of 2008 and the slow recovery, as families continue to struggle. As noted, many breadwinners work multiple jobs to support their children and keep their homes. For other families, the severity of the economic crisis leaves them homeless or without stable housing. According to the Community Foundation research, 4.4% of grade students in Riverside County and 6.6% of students in San Bernardino County lack stable housing. Requests for government assistance by struggling families have increased as well. Families are more reliant on state and federal programs like CalFresh, a federal supplemental nutrition program; CalWorks, providing cash aid and employment services to eligible families; and MediCal, a medical assistance program for low-income families. Girl Scouts of San Gorgonio Council is determined to provide programming and support to all girls and their families, including those in the dire circumstances. The Council is working with family assistance facilities, community centers, schools, churches, and other agencies to provide girls with the Girl Scout experience and the vital resources they need to reach their full potential. GSSGC offers them stability in an inclusive environment, positive role models, and the opportunity to make a difference in their own lives, their communities and the world. STRATEGIC PLAN DEVELOPMENT OF THE STRATEGIC PLAN The Girl Scouts of San Gorgonio Council (GSSGC) worked with Girl Scouts of the USA’s Council Partnership Consultant, Margaret Renwand, who guided the Strategic Planning Process. Her superb work and dedication to the San Gorgonio Council was vital to the planning and production of this document. The first step in the Strategic Planning Process was the convening of the Board of Directors and executive staff members at The Annenberg Retreat at Sunnylands. Barbara Jetter, Monna Loftis and Margaret Renwand, all Girl Scouts of the USA consultants, attended and/or guided the day-long discussion. The work culminated in an exercise through which the Board of Directors identified the areas of focus for the next four years that are critical to the Council’s success. These focus areas guided the Strategic Planning Teams in their work. In January 2013, the Board of Directors identified the following four focus areas. 1. Holistic view of the value of the organization: individuals, families, and communities 2. Community collaborations, partnerships, and alliances 3. Leverage cultural diversity within communities 4. Resource and asset development Due to his exemplary work, Manager of Administration and Executive Offices Leonard Longo was entrusted to serve as Project Manager for the entire Strategic Learning process, beginning in March 2013 and continuing through March 2014. Leonard performed brilliantly and worked collaboratively with GSUSA Consultant Margaret Renwand. Their first step was to form Strategic Planning Teams composed of members of the Council staff, members of the Board, Council volunteers and community leaders. These teams were directed to research the foci through the following perspective: 1. Customers 2. Competitors 3. Stakeholders 4. Sector Trends 5. Council’s Own Realities After countless hours of research, discussion, and debate, the Strategic Planning Teams reached a consensus in indentifying the Council’s customer focus, five key priorities, and organizational imperatives for the next four years. The work of the Strategic Planning Teams was approved by the Board of Directors at the April 2013 Board of Directors Meeting. The work of strategic planning was then placed in the hands of Council staff. Five teams were formed; one for each key priority, and every Council staff member was assigned to a team based on her or his individual expertise and knowledge within the organization. The teams developed action plans, which centered on the five key priorities and kept the attention on the Council’s customer focus and winning proposition. In addition, each team was asked to identify the Council’s current situation in regards to their key priority and where the Council should be in 2017 in order for the organization to be successful. The action plans presented in detail in this document are the final result of the Strategic Planning Process. The action plans represent a roadmap that will guide the Council to its desired future state in 2017. These plans have been reviewed and are supported by the President & CEO and the Council’s Executive Team. UTILIZATION OF THE STRATEGIC PLAN This Strategic Plan is a source of information for staff, the Board of Directors, potential funding agencies, supporting institutions, and other professional organizations. Ultimately, this plan will guide the actions of the Girl Scouts of San Gorgonio Council over the next four years. The Girl Scouts of San Gorgonio Council undertook the Strategic Planning Process to identify key areas the organization needed to focus on to be successful in the coming years. As a result, the Council will focus on the following: 1. Recruit girls that more closely reflect the diversity of our communities 2. Provide more support and structure for volunteers 3. Increase programming for girls and volunteers 4. Increase and diversify revenue streams 5. Increase Girl Scouts’ visibility within the community This Strategic Plan will be the Council’s guiding document. All programs, budgets and employee performance reviews will be built upon this plan. Progress toward implementation of this plan will be reported quarterly by staff, presented in “dashboard” form to the Board of Directors at its regular meetings, and evaluated by all managers and staff on a monthly basis. STRATEGIC PLANNING RESULTS CUSTOMER FOCUS The Girl Scouts of San Gorgonio Council will recruit girls in grades K-5 and retain girls in grades 6-8 who reflect the diversity of the region, with a focus on low income communities, by offering valuable opportunities and lifechanging experiences. WINNING PROPOSITION The Girl Scouts of San Gorgonio Council provides girls with the path to leadership and self-sufficiency that will change their world.  ROGRAM: Provide valuable opportunities for the Girl Scout Leadership Experience through innovative, P robust pathways that are accessible to all girls.  UNDING: Build the GSSGC culture of philanthropy through the creation of sustainable and diverse F funding sources and cultivating new sources of revenue.  OMMUNITY VISIBILITY: Build the Councilâ&#x20AC;&#x2122;s community visibility by expanding our media presence C in all markets, partnering with organizations and cultural institutions, and communicating the community impact of Girl Scouts. Ensure communications are multilingual.  ECHNOLOGY: Ensure technology systems support membership growth, programming for girls, T volunteerism, fund development, and communications. CULTURE: Create a culture of innovation and inclusion that provides consistent best practices and exceptional experiences for girls and volunteers. KEY PRIORITIES MEMBERSHIP Increase girl market share, diversity, and adult membership.  YSTEMS: Review, improve, and establish and reinforce growth systems that support the Councilâ&#x20AC;&#x2122;s growth S in membership. MARKETING: Have a united message that serves membership growth across all five regions. TRAINING: Provide the appropriate training and strengthen the membership support system. DIVERSITY: Recruit girls and adults that reflect the diversity of the community. ADULTS: Onboard new members quickly and acclimate them to their new volunteer positions.  IRLS: Increase the number of girls K-5; retain middle school-aged girls at a higher percentage; and, have G a long-term commitment to bring the Girl Scout program to high-poverty girls. VOLUNTEERISM Expand and diversify volunteer opportunities through the development of structures and systems that provide volunteers with valuable, relevant, and transferable skills.  PISODIC VOLUNTEERS: Develop a database system that tracks all volunteers in various capacities and E can be utilized by all departments.  OLUNTEERISM: Establish a Volunteerism Department to support all volunteers throughout the V organization. TRAINING: Provide accessible training that is clear, consistent, and that is available on multiple platforms. PROGRAM Provide valuable opportunities for the Girl Scout Leadership Experience through innovative, robust pathways that are accessible to all girls.  IRL SCOUT LEADERSHIP EXPERIENCE: Analyze current programs being offered and assure that G they are focused on the Girl Scout Leadership Experience, and that they are fully utilizing the GSUSA National Portfolio. Plan accordingly for future programs.  UTDOOR PROGRAMMING AND FACILITIES: Improve and increase the number of programs O offered. Improve outdoor properties and increase facilities use. FUNDING Build our culture of philanthropy through the creation of sustainable and diverse funding sources and cultivating new sources of revenue. INDIVIDUAL ENGAGEMENT: Engage more individuals to contribute. FUNDER RELATIONSHIPS: Develop relationships with companies and corporate funders within the San Gorgonio jurisdiction. GIVING CAMPAIGNS: Restructure giving campaigns and develop more structured giving programs. COMMUNITY VISIBILITY Build our community visibility by expanding our media presence in all markets, partnering with organizations and cultural institutions, and communicating the community impact of Girl Scouts. Insure communications are multilingual.  EDIA RELATIONSHIPS: Establish better relationships with local media outlets that cover the areas M within the San Gorgonio Council.  IRL SCOUT REPORTER PROGRAM: Develop and support a girl reporter program that can result in G girl-generated stories published throughout the Councilâ&#x20AC;&#x2122;s different communication outlets.  OMMUNITY CHAMPIONS PROGRAM: Create a Communities Champions Program with volunteers C in the organization who are knowledgeable about Girl Scouts and San Gorgonio, and who can work alongside staff with outreach and recruitment.  OMMUNITY RELATIONSHIPS: Identify and cultivate relationships with corporations and other C organizations in the communities we serve.  ULTILINGUAL COMMUNICATIONS: Create multi-lingual and multi-cultural communications to reach M all girls and their families. MEMBERSHIP INCREASE GIRL MARKET SHARE, DIVERSITY, AND ADULT MEMBERSHIP. SYSTEMS CURRENT STATE: The Girl Scouts of San Gorgonio Council experienced a rapid 22% growth rate from the end of 2011 until the end of 2013. There is a critical need to have systems in place to support this growth. FUTURE STATE: The Council will have systems in place to support continued sustained growth in membership. 2014 GOALS: Establish a culture of collaboration, unity and transparency throughout the Membership Department. Engage all volunteer service area teams for deeper knowledge and productivity. Make Girl Scouts more visible in the community, through the activities of the Membership Department. WORK TO BE ACCOMPLISHED:  onduct Membership meetings every other month to review benchmarks and report on current work in C achieving membership goals. Meetings will serve as a forum to discuss collaborations, best practices, and the health and needs of the regions.  embership will have a greater presence in community activities, such as city and regional events, fairs, M and local meetings. Arrange for troops to participate in more civic engagements (e.g., flag ceremonies). Distribute marketing materials about Girl Scouting throughout San Bernardino and Riverside counties. HOW COUNCIL WILL KNOW IT HAS BEEN SUCCESSFUL IN 2014: Membership meets all benchmarks and goals. Council-wide collaborations and partnerships established.  rograms include strategies that can better deliver the Girl Scout Leadership Experience (GSLE) in different P regions. Increased volunteer participation in programs and events. Volunteers will take ownership and lead the recruitment cycle. Volunteers and Membership will be one team, unified by the same goals and objectives. 2015 GOALS:  ontinue to support a culture of collaboration, unity and transparency throughout the Membership C Department. Expand opportunities for volunteer involvement. Recruit and train a Council color guard team. Develop plans to increase parent involvement.  ake Girl Scouts more visible in the community, through the public activities of the Membership M Department. WORK TO BE ACCOMPLISHED:  ontinue to make Membership meetings meaningful and fulfilling. Meetings will serve as a forum to C discuss collaborations, best practices, and the health and needs of the regions.  tilize Volunteerismâ&#x20AC;&#x2122;s on-boarding system and management of volunteers for future opportunities and U needs.  ecruit and train girls for a Council color guard team. The team will be diverse and be open to girls from R all regions. Work with other departments and volunteers to develop a plan that will increase parent participation. HOW COUNCIL WILL KNOW IT HAS BEEN SUCCESSFUL IN 2015:  he Membership Departmentâ&#x20AC;&#x2122;s culture will be one of collaboration, unity, and accountability as shown T by supporting each other in meeting benchmarks, increased participation in discussions and creative collaborations among staff members. Presenting more recruitment and community events. A color guard team will be developed, trained, and available for community events. Increased participation by parents, volunteers and girls. Marketing collateral and Membership materials will be widely distributed throughout the community. 2016 GOALS: Achieve departmental culture of collaboration, unity, and accountability. Sustain and grow volunteer and parent involvement.  ake Girl Scouts more visible in the community through the public activities of the Membership M Department to promote the GSLE. Expand the color guard program to all the regions. WORK TO BE ACCOMPLISHED: Evaluate the work of Membership to determine its level of collaborative work.  valuate current participation of staff and volunteers to make Girl Scouts more visible in the community, E through the public activities of the Membership Department to promote the GSLE. Benchmark best practices to further engage volunteers and effectively deliver the GSLE. Establish a color guard team in each region.  ire 2 Customer Service Associates (CSA), one for the High Desert and another for the Low Desert, to H support parents, volunteers and girls. HOW COUNCIL WILL KNOW IT HAS BEEN SUCCESSFUL IN 2016: Evidence of collaborative work among Membership staff members. Increased volunteer and staff participation in the annual number of public activities. Data will be gathered about best practices within the Girl Scout movement. A color guard team will be available in every region for community events. MARKETING CURRENT STATE: A compelling, clear and concise membership message and marketing plan is needed, to recruit more girls and increase volunteer support. FUTURE STATE: Girl and adult membership numbers increase. 2014 GOALS:  embership staff will develop a compelling, clear and concise message to promote the GSLE, internally M and externally.  rovide information to External Relations Department for promotion of Membership Departmentâ&#x20AC;&#x2122;s P activities. WORK TO BE ACCOMPLISHED:  embership Department staff will review GSLE national marketing messaging and develop the San M Gorgonio Council message, based on that information and tailored for the unique market served by GSSGC.  egularly inform the External Relations Department about upcoming Membership events and provide R recap information for further promotional stories. HOW COUNCIL WILL KNOW IT HAS BEEN SUCCESSFUL IN 2014:  essage clarity will lead to greater interest in Girl Scouts and increased numbers of girls and adults M registering for Girl Scouts.  egularly updating External Relations Department will increase the number of hits, posts and press R releases picked up for publication. 2015 GOALS: Develop a Membership Department Marketing Plan. Produce more information about events, activities and GSLE experiences. WORK TO BE ACCOMPLISHED: Membership Department to work with External Relations Department to develop a Marketing Plan. Train all Membership staff in the utilization of the Marketing Plan.  egularly update External Relations Department to increase the number of hits, posts and press releases R picked up for publication. 2016 GOALS: Evaluate Membership messaging and the Marketing Plan to keep both relevant and current. Improve the message and plan based upon evaluation results.  efresh updates to External Relations Department, based on revised messaging and Membership R Marketing Plan. WORK TO BE ACCOMPLISHED: Develop and administer an effective evaluation instrument; collect and analyze data. Revise messaging and plan based upon evaluation. Review National Membership messaging and Marketing Plans to align with changes and trends.  efresh PR templates for External Relations Department, based on revised messaging and Membership R Marketing Plan. HOW COUNCIL WILL KNOW IT HAS BEEN SUCCESSFUL IN 2016:  aving revised messaging and an updated Membership Marketing Plan will lead to more current H communication with girls and adults, lead to greater interest in Girl Scouts, and result in increased numbers of girls and adults participating in Girl Scouts.  resh format and messaging provided to the External Relations Department will lead to renewed interest F about Girl Scout activities will further increase the number of hits, posts and press releases picked up for publication. Membership Department has not kept pace. Training must expand at all levels for volunteers and girls. FUTURE STATE: Every volunteer will be fully prepared for their position. Every girl will be well versed in the GSLE. 2014 GOALS: Determine gaps in training and knowledge among volunteers and girls. Add classes and disseminate GSLE information. WORK TO BE ACCOMPLISHED:  valuate current training to determine the levels, depth and frequency. Also, determine the number of E training sessions and subjects that should be taught in Spanish. Compare the current state to best practices in the field. ncrease the number of classes. Disseminate GSLE information through five regions. 2015 GOALS:  dd more classes based upon gaps in training and knowledge among volunteers and girls as revealed A through program evaluation. Evaluate and update all training materials. Disseminate GSLE information to other agencies and nonprofits working with and/or advocating for girls. WORK TO BE ACCOMPLISHED: Add more training classes. Evaluate and update all training materials. Disseminate GSLE information to other agencies and nonprofits working with and/or advocating for girls. 2016 GOALS: Every volunteer will be fully prepared for her or his position. Every girl will be well versed in the GSLE. HOW COUNCIL WILL KNOW IT HAS BEEN SUCCESSFUL IN 2016: Every volunteer is fully prepared for her or his position.  raining program reflects best practices in the field and is tailored to the unique needs of San Gorgonio T volunteers. More girls participate in GSLE. DIVERSITY CURRENT STATE: Council staff, volunteers, adult members and girl members are diverse, but not proportionally diverse to the general population of Riverside and San Bernardino counties. FUTURE STATE: The Councilâ&#x20AC;&#x2122;s staff, volunteers, girl members and adult members will mirror the diversity of the region served. 2014 GOALS: Understand the range of diversity internally within the Council. Develop collateral materials in Spanish and other languages. All staff will be trained in cultural awareness and sensitivity. Increase the number of girls and adults from diverse backgrounds. WORK TO BE ACCOMPLISHED:  esearch the ethnic, cultural, socio-economic, religious, and linguistic diversity of the Council as R represented by staff, volunteers, and girl and adult members. Share the findings with all staff.  ork with the External Relations Department to develop recruitment and membership collateral materials W in Spanish and other languages.  ll staff will be trained in a series of cultural awareness and sensitivity workshops, conducted by the A External Relations Department.  ecruit new members from diverse backgrounds. Utilize the Membership Departmentâ&#x20AC;&#x2122;s Diversity Outreach R Team for targeted recruitment.  howcase a different employee each month at the All Staff meeting to highlight her or his talents, S experience and unique background. HOW COUNCIL WILL KNOW IT HAS BEEN SUCCESSFUL IN 2014: Volunteers will not be held back by the obstacles of language. Girls and their parents will learn about Girl Scouting in a welcoming environment.  ollateral membership materials, tailored to cultural and language needs, will be disseminated to girls and C their families.  taff will have a greater understanding of ethnic and cultural differences among the Council staff, S volunteers, and girl and adult members The number of girls and adults from diverse backgrounds will increase. 2015 GOALS:  embership will develop and implement specific recruitment and retention strategies based on the M unique populations in San Gorgonio Council. WORK TO BE ACCOMPLISHED: Continue community engagement in diverse communities. Maintain focus on recruiting girls and adults that reflect the diversity of the Council area served. Review and make appropriate changes to the membership collateral materials. Continue recruitment events with the Councilâ&#x20AC;&#x2122;s Multicultural Outreach Team.  ll staff continues training in a series of cultural awareness and sensitivity workshops, given by External A Relations Department.  howcase a different employee each month at the All Staff meeting to highlight her or his talents, S experience and unique background. HOW COUNCIL WILL KNOW IT HAS BEEN SUCCESSFUL IN 2015: Achieving more balanced and diverse membership, staff and volunteer cadre. Increased membership of girls and adults representing ethnic, cultural, socio-economic, religious, and linguistic diversity. 2016 GOALS: Achieve greater diversity that more closely mirrors the Councilâ&#x20AC;&#x2122;s regional composition. Show growth in membership diversity. WORK TO BE ACCOMPLISHED:  ocus work will be determined from the membership results from 2014 and 2015; adjust strategies F accordingly. Continue community engagement in diverse communities. Maintain focus on recruiting girls and adults that reflect the diversity of the Council region served. Review and make appropriate changes to the membership collateral materials. Continue recruitment events with the Councilâ&#x20AC;&#x2122;s Multicultural Outreach Team.  ll staff continues training in a series of cultural awareness and sensitivity workshops, given by External A Relations Department.  howcase a different employee each month at the All Staff meeting to highlight her or his talents, S experience and unique background. HOW COUNCIL WILL KNOW IT HAS BEEN SUCCESSFUL IN 2016:  iversity will have continued to increase over the last three years to more closely reflect the regionâ&#x20AC;&#x2122;s D diversity. Meet diversity goals in membership, staff and volunteers.  irl Scouts has become more visible and valued in diverse communities of Riverside and San Bernardino G counties. and urgent problem. San Gorgonio needs more volunteers and currently has weak systems, a lack of trainers and excessive paperwork--all of which make it difficult for those wishing to volunteer. FUTURE STATE: Make it easy to volunteer by streamlining systems, becoming well-trained and prepared for responsibilities, and confident to begin service. 2014 GOALS: Define focused responsibilities for the volunteers. Work on developing enrichment opportunities. WORK TO BE ACCOMPLISHED: Collaborate with the Volunteer Department to clearly identify roles and scope of responsibility.  onsult with the Regional Volunteer Teams to see how the Service Area Meetings can be used to train and C enrich the volunteers with various courses. 2015 GOALS:  egin offering enrichment workshops and trainings that can be delivered at the Service Area Meetings in B all the regions. WORK TO BE ACCOMPLISHED:  ogether with the Membership Department, Volunteer Department, and the Service Areas, develop and T offer enrichment opportunities at meetings. HOW THE COUNCIL WILL KNOW IT HAS BEEN SUCCESSFUL IN 2015: Courses will be well received. Members will effectively seek trainings and additional opportunities that are offered. 2016 GOALS: Evaluate and improve the course offerings. WORK TO BE ACCOMPLISHED:  valuate the courses through talking with the members and staff, and distribute surveys for the course E attendees to complete. HOW THE COUNCIL WILL KNOW IT HAS BEEN SUCCESSFUL IN 2016:  he surveys and assessments that are returned will be analyzed and new strategies will be implemented to T improve Membership enrichment course offerings. GIRLS CURRENT STATE: San Gorgonio is slowly losing girl members at the kindergarten through fifth grade level. Since this age group is the pipeline for later involvement and commitment to Girl Scouts, any decrease at this level must be addressed. Additionally, the age for greatest attrition from Girl Scouts is during middle school â&#x20AC;&#x201C; a critical time for girls. If a Girl Scout continues through middle school, her chances of graduating from high school, continuing higher education, delaying child bearing, earning more money in her lifetime and attaining an overall better life is exponentially increased. All of these benefits are magnified for girls growing up in high-poverty families. FUTURE STATE: Increase the number of girls K-5, retain middle school girls at a higher percentage, and make a long-term commitment to bring the Girl Scout program to high-poverty girls. 2014 GOALS: Increase the number of girls K-5. Retain more middle school girls. Reach out to high-poverty girls. WORK TO BE ACCOMPLISHED: Focus recruitment efforts on K-5 girls. Conduct programs specifically aimed at topics pertinent to middle school girls. Create community and school partnerships to reach out to high-poverty communities. HOW THE COUNCIL WILL KNOW IT HAS BEEN SUCCESSFUL IN 2014: Increased K-5 membership Higher retention rate for middle school girls  chieve new partnerships with schools, community agencies and other nonprofits addressing challenges A facing high-poverty girls. 2015 GOALS: Increase the number of girls K-5. Retain more middle school girls. Reach out to high-poverty girls. WORK TO BE ACCOMPLISHED: Focus recruitment efforts on girls K-5. Conduct programs specifically aimed at topics pertinent to middle school girls.  ork with other community and school partners to reach out to high-poverty communities and offer W scholarships to girls requiring financial assistance to pay for Girl Scout membership and other activities, such as camp. 2016 GOALS: Increase the number of girls K-5  etain more middle school girls. Continue the long-term commitment to bring the Girl Scout program to R high-poverty girls. WORK TO BE ACCOMPLISHED: Evaluate outreach work.  nalyze data against current population trends in Riverside and San Bernardino counties (e.g., improved A economy or movement out of region due to economic drivers). Fine tune outreach efforts. Continue to recruit K-5 girls, retain more middle school girls, and serve high-poverty girls. HOW THE COUNCIL WILL KNOW IT HAS BEEN SUCCESSFUL IN 2016: Increase the number of girls K-5. Retain more middle school girls. Continue the long-term commitment to bring the Girl Scout program to high-poverty girls. VOLUNTEERISM EXPAND AND DIVERSIFY VOLUNTEER OPPORTUNITIES THROUGH THE DEVELOPMENT OF STRUCTURES AND SYSTEMS THAT PROVIDE VOLUNTEERS WITH VALUABLE, RELEVANT, AND TRANSFERABLE SKILLS. volunteers, including episodic volunteers. The system will be centralized and support all departments. The database will identify skills, languages, availability, areas of expertise, and any other relevant details. 2014 GOALS:  egin building a volunteer management database to track and identify episodic volunteers based upon B volunteer needs. The database will be maintained. WORK TO BE ACCOMPLISHED: Create and provide episodic volunteer packets to provide information about GSSGC to new volunteers. Each department will provide a list of needs that can be fulfilled by episodic volunteers.  aintain the new volunteer management database on Personify by performing data entry, handling M contact requests, connecting staff to volunteers, and providing updates.  he database will include potential volunteer candidates, including those from other agencies, which are T interested in short term volunteer opportunities. The database will also track language(s) spoken of volunteers. Create an application for adults to apply to become a volunteer. Create a system for volunteers to request information about available volunteer opportunities.  reate a contact list of GSSGC multilingual staff members to address volunteers in their preferred C language.  ake the process of managing episodic volunteers transparent to volunteers, GSSGC staff, and those M outside of GSSGC. HOW THE COUNCIL WILL KNOW IT HAS BEEN SUCCESSFUL IN 2014: A fully functional volunteer module will be established. Procedures will reflect the process of recruitment and flow of episodic volunteers. The volunteer database will be easily accessible and used by staff and others. 2015 GOALS: Continue to update the database. Continue to translate materials to accommodate multiple languages.  rovide training on the procedures involved to properly handle requests and routing of episodic P volunteers. WORK TO BE ACCOMPLISHED: Update episodic volunteer orientation packets as needed. Update and maintain the volunteer module to contain current data, including exiting volunteer data. HOW THE COUNCIL WILL KNOW IT HAS BEEN SUCCESSFUL IN 2015: The volunteer module will be continually used to support episodic volunteers.  rocedures will continue to reflect the processes of recruitment, retention, and support of episodic P volunteers.  he database will continue to be centralized within GSSGC and accessible to staff and other authorized T users. 2016 GOALS: Continue to expand and strengthen the volunteer database and procedures for episodic volunteers. WORK TO BE ACCOMPLISHED: Continue to update volunteer application information in the Personify module.  ontinue to collaborate with all departments to ensure needs are met of both episodic volunteers and C those that use them. HOW THE COUNCIL WILL KNOW IT HAS BEEN SUCCESSFUL IN 2016: Episodic volunteer information will be up to date. Episodic volunteers will know they are supported. All departments will work with one another via the volunteer database and system. VOLUNTEERS CURRENT STATE: No single department focuses on volunteer support. The work is divided between the Programs and Membership staff. There are no clear guidelines for the volunteer processes. will have a thorough understanding of our organization and these processes. There will be improved collaboration and understanding among departments. 2014 GOALS: Enhance interdepartmental communications Create a standardized process to train, and directly and indirectly support volunteers Make the volunteer structure streamlined and consistent. Mend the volunteer infrastructure. Create and define volunteer job descriptions. Determine ways to engage Spanish language preferred volunteers. Recruit and maintain a diverse volunteer population. WORK TO BE ACCOMPLISHED:  old monthly all-staff meetings to notify other departments of volunteer or troop issues and provide H collaboration opportunities. Create and provide volunteer orientation packets. Make trainings more accessible.  equire new leaders to meet with a Membership Manager (staff) to review the orientation packet before R beginning the troop.  reate a new leader procedure to include the following items: volunteer application, background check, C phone interview, Basic Leadership Training, orientation meeting, assignment of the troop number and bank account. Fill open service area and regional positions. Provide effective and thorough training for service area and regional position volunteers. Publicize which volunteer positions are vacant and filled. Promote regional and city meetings. Develop materials and provide trainings in Spanish. HOW COUNCIL WILL KNOW IT HAS BEEN SUCCESSFUL IN 2014: Volunteers will be sustained. Overall adult registration will increase. 2015 GOALS: Continue the goals outlined in 2014. Establish volunteer ambassadors who can engage in communities that are unfamiliar with Girl Scouts. WORK TO BE ACCOMPLISHED: Continue the work outlined in 2014. Create volunteer ambassador job descriptions and goals. Recruit volunteer ambassadors. Train volunteer ambassadors. Monitor and support volunteer ambassadors. HOW COUNCIL WILL KNOW IT HAS BEEN SUCCESSFUL IN 2015: Maintain success outlined in 2014. There are active and productive volunteer ambassadors in the community. 2016 GOALS: Continue the goals outlined in 2014 and 2015. WORK TO BE ACCOMPLISHED: Continue the work outlined in 2014 and 2015. HOW COUNCIL WILL KNOW IT HAS BEEN SUCCESSFUL IN 2015: Maintain the success outlined in 2014 and 2015.  ssess the development and growth of the department by comparing the 2016 state to the past state and A the original projected future state. materials. Council staff is uninformed about training availability and the content of training offered. There is a lack of flexibility in training opportunities--particularly, technology is underutilized. FUTURE STATE: Training will be accessible and offered on multiple platforms. Training will be offered in multiple languages with multilingual materials. Communication will improve interdepartmentally about the availability and the content of training. 2014 GOALS: Evaluate all training materials. Streamline training materials. Create training materials in Spanish. WORK TO BE ACCOMPLISHED: Engage volunteers to form committees to review each of the training classes for updates and streamlining. Translate revised materials into Spanish via the Training Specialist.  stablish outlines and curriculum offerings for the Leadership University (workshops to attain transferable E skills). Hold a kickoff event for the Leadership University. HOW COUNCIL WILL KNOW IT HAS BEEN SUCCESSFUL IN 2014: Increased number of Spanish speaking leaders. Increased number of troops. Increased number of adult volunteers to aid troops. There will be fewer super troops, because more regular troops will be formed. Connections to the community will increase due to the Leadership University. 2015 GOALS: Increase the number of online trainings offered. Increase the number of Outdoor Education trainings offered. Increase the Leadership University offerings. Start the process to have Leadership University training approved for Continuing Education credit. WORK TO BE ACCOMPLISHED: Research online training options best practices. Actively recruit new volunteer trainers to specialize in Outdoor Education. Offer more Outdoor Education trainings via the new specialized trainers. HOW COUNCIL WILL KNOW IT HAS BEEN SUCCESSFUL IN 2015: Use of Council properties will increase. Programming events staffed by trained volunteers will increase. 2016 GOALS:  onitor, evaluate, and revise as needed the goals outlined in 2014 and 2015, via feedback from staff, M volunteers, and the community. WORK TO BE ACCOMPLISHED:  evelop a standardized evaluation system for the goals, work and measures of success outlined in 2014 D and 2015. HOW COUNCIL WILL KNOW IT HAS BEEN SUCCESSFUL IN 2016: Continuing Education Units will be approved for the Leadership University. The Leadership University will be held regularly in all Council regions. There will be substantial participation in the Leadership University. PROGRAMS PROVIDE VALUABLE OPPORTUNITIES FOR THE GIRL SCOUT LEADERSHIP EXPERIENCE THROUGH INNOVATIVE, ROBUST PATHWAYS THAT ARE ACCESSIBLE TO ALL GIRLS. underutilizes the GSUSA National Portfolio. There is a general preconceived negativity from leaders toward the use of Journeys, leading to our girls not being provided with all the benefits of the GSLE. FUTURE STATE: The Council will utilize the GSLE primarily through volunteer-led delivery methods. Additionally, it will be delivered through all Pathways. Lastly, the GSLE will provide positive outcomes. 2014 GOALS: Create a list of the ways an episodic volunteer can usefully donate time.  ork with the Fund Development and Membership Departments to increase the number of episodic W volunteers. Increase consistency within the training module for current and new staff, which recognizes the crossfunctionality of the Council and is cognizant of the unique positions. Develop more Journey Programs for staff and volunteers to use and ensure girls are participating in GSLE. Increase the number of Juliettes (girls that participate individually in Girl Scouts). Increase the number of volunteers serving Juliettes. Increase attendance at events by Juliettes. WORK TO BE ACCOMPLISHED: Identify, classify, and define episodic volunteer opportunities for episodic volunteers and camp volunteers. Create a database for this data. Advertise volunteer trainings and opportunities to existing volunteers and to recruit new volunteers. Train current and new staff on the National Program Portfolio, including the GSLE and Journey books.  reate level specific, multisession programs based on Journeys for each level that are ready to use. (aka C â&#x20AC;&#x153;Program in a Boxâ&#x20AC;?)  reate level specific, multisession programs based on Journeys for multi-level troops that are ready to use C Program in a Box.  ork with the Membership Department to identify and appoint Juliette coordinators in all regions/service W areas.  ork with the Membership Department to create and utilize a marketing toolkit focused on the benefits of W being a part of the Juliette program. Create Pathway programs that are designed to accommodate Juliettes. HOW THE COUNCIL WILL KNOW IT HAS BEEN SUCCESSFUL IN 2014: Volunteers will be committed to the new Journeys. Volunteers will be excited about new opportunities.  taff will understand the National Program Portfolio and they will use the marketing toolkit to recruit girls S into all Pathways.  here will be plenty of opportunities for girls to transition from activity to activity within Girl Scouts based T on interest and time. 2015 GOALS: Continue with the list of ways episodic volunteers donate their time. Increase the number of episodic volunteers.  evelop a system to implement in 2016 regarding how to engage episodic volunteers in Girl Scout D activities. Increase awareness and usage of the National Program Portfolio (GSLE & Journeys). Increase Juliette attendance at events. WORK TO BE ACCOMPLISHED: Identify, classify and define episodic volunteer opportunities in the following areas: series volunteers, event volunteers, and camp volunteers. Create a database for this data.  dvertise volunteer trainings and opportunities to alumnae and continue advertising to existing A volunteers. Create a user friendly, accessible system to connect potential volunteers to volunteer opportunities. Improve the training system for new staff to ensure that every staff member is familiar with the GSLE and Journeys.  evise and create marketing materials and events to reintroduce the GSLE and Journeys to volunteers and R girls. HOW THE COUNCIL WILL KNOW IT HAS BEEN SUCCESSFUL IN 2015: Increased attendance at events. More girls and volunteers will participate in Journeys and the GSLE. A marketing toolkit will be released to volunteers and ready for use with troops and the community.  olunteers will participate in more and a wider variety of volunteer opportunities that are tailored to length V of time and interests that they prefer. Increase in the number of volunteer-led Pathway opportunities available to girls. 2016 GOALS: Add to expanded list of ways episodic volunteer donate their time. Increase the total number of episodic volunteers. Develop a system to engage episodic volunteers in Girl Scout activities for implementation in 2017. Increase attendance at events by Juliettes. WORK TO BE ACCOMPLISHED: Identify, classify, and define episodic volunteer opportunities in the following areas: virtual volunteers, event volunteers, camp volunteers and series volunteers. Continue to use the database to track this information. Recruit and advertise volunteer trainings and opportunities to community. Continue to advertise to existing volunteers and alumnae. Implement training on new volunteer opportunity system. Maintain system for training new staff on GSLE and Journeys. Create Pathway programs that are designed to accommodate Juliettes. HOW THE COUNCIL WILL KNOW IT HAS BEEN SUCCESSFUL IN 2016: More girls will participate in the opportunities and experiences offered. Increased numbers of volunteers will want to participate and donate their time to help out at events. Girls, their families, and volunteers will embrace the National Program Portfolio and the GSLE. OUTDOOR PROGRAMMING AND PROPERTY USE CURRENT STATE: Girls are not given enough opportunity to experience the GSLE in an outdoor setting. Facilities are underutilized and many troop leaders are unaware of the facilitiesâ&#x20AC;&#x2122; availability. properties and other outdoor facilities. All Council-owned facilities are utilized to their fullest potential for the purposes of girl programming in all of the Pathways. 2014 GOALS: Increase the number of girls and volunteers using Council facilities by determining why they are not utilizing those locations for meetings and events. Create timelines, budgets and resources needed for long-term camp property plan. Create a plan for increasing property and financial aid funding. Increase property use through an easy-to-use reservation system. WORK TO BE ACCOMPLISHED: Work closely with the Board of Directorsâ&#x20AC;&#x2122; Property Committee.  reate an online and hard copy survey that is accessible to all members. The survey will be distributed C through a variety of ways: stuffers, mailings, e-mailing, etc. Inquire why troops are not utilizing the current facilities. Inquire what types of outdoor programming are wanted and needed. Determine how troops are participating in outdoor programming.  ompile a list of updates and projects that need to be completed at Camp Azalea Trails (Camp AT) and C Camp Tautona. The list will be ongoing for Camp AT. Create an easy system to book facilities council wide. Train the staff on the new reservation system. Consistently implement outcome measurement evaluations at all events. HOW THE COUNCIL WILL KNOW IT HAS BEEN SUCCESSFUL IN 2014:  ew registration system will be utilized by volunteers and staff after adequate training on how to use the N system.  reate list of all current property, description, history, status and needs. List to be provided to the C Properties Committee and the Fund Development Department. Systematic improvements to Council properties will begin. 2015 GOALS: Increase the number of girls and volunteers using existing facilities by creating a plan based on survey results collected in 2014.  rovide camp scholarship and increase the number of programs provided to low-income communities, P resulting in more total participants. Increase the number of trained volunteers that are knowledgeable and comfortable with facilitating outdoor programs for girls in the troop setting. Increase the usage of Council facilities, resulting in an increase in revenue and greater per-day use. WORK TO BE ACCOMPLISHED: Work closely with the Board of Directorsâ&#x20AC;&#x2122; Property Committee. Analyze survey results and utilize the data by creating a plan to address issues with underused facilities. Compile a list of updates and projects that need to be completed at Camp AT (ongoing annually). Create a long-term marketing plan to generate funds and complete costly repairs. Create a long-term marketing plan for generating funds to provide outdoor programming. Develop robust outdoor education trainings for volunteers in line with the GSLE. Create a long term marketing plan for Council facility use. HOW THE COUNCIL WILL KNOW IT HAS BEEN SUCCESSFUL IN 2015: The survey results will be analyzed and plans will be created to address facility and program issues.  eeded improvements will be identified and addressed. Camp repairs and renovations will continue N throughout the year.  he marketing plan will be developed to raise funds for updates to the properties; to generate funds for T outdoor programming; and to determine the facility usage. Improvements to Council properties will commence in a systematic manner. 2016 GOALS:  he outdoor programming needs of the girls and volunteers will continue to be a priority and will be T addressed accordingly. Compile a revised list of updates and projects that need to be completed at Council facilities. Increase usage of facilities, resulting in increased revenue and greater per day use. WORK TO BE ACCOMPLISHED: Work closely with the Board of Directorsâ&#x20AC;&#x2122; Property Committee.  etermine how troops have utilized the Council facilities over the past 3 years and develop strategies to D improve attendance, variety and quality of outdoor programming. Projects for the Council properties are identified and the work is completed throughout the year. Implement a long-term marketing plan for facility use. HOW THE COUNCIL WILL KNOW IT HAS BEEN SUCCESSFUL IN 2016: Council facilities use will increase. More outdoor programming opportunities will be available to troops. Improvements to Council properties will be completed. FUNDING BUILD A CULTURE OF PHILANTHROPY THROUGH THE CREATION OF SUSTAINABLE AND DIVERSE FUNDING SOURCES AND CULTIVATING NEW SOURCES OF REVENUE. INDIVIDUAL ENGAGEMENT OF PHILANTHROPIC INDIVIDUALS CURRENT STATE: The Girl Scouts of San Gorgonio Council needs to engage more philanthropists to contribute to the organization. FUTURE STATE: By 2016, the San Gorgonio Council will increase the number of regular financial donors to support all the facets of the organization. 2014 GOALS: Determine a financial goal for individual donations.  stablish ongoing volunteer and mentoring engagement opportunities that are meaningful for donors and E potential donors. Reach out to the communities served by GSSGC to educate and engage new partners. Develop and implement a relationship management process utilizing Raiser’s Edge. WORK TO BE ACCOMPLISHED: Work closely with the Board of Directors’ Fund Development Committee. Obtain contact information for philanthropists in the community.  ork with the Volunteer Department to develop episodic volunteer opportunities to engage individuals in W the community. Communicate on a regular basis with individuals we are engaging within the community.  egularly reach out to the community with Public Relations (PR) in regards to Council activities that speak R to the heart – seek out new partners through print and social media. Develop a relationship management system and maintain it in Raiser’s Edge. Ask individuals to support the Council with a financial donation. Develop a recognition program for donors. HOW THE COUNCIL WILL KNOW IT HAS BEEN SUCCESSFUL IN 2014: The Council will cultivate ongoing relationships with donors and prospective donors. The donor solicitation will increase. Donations from individuals will increase. 2015 GOALS: Establish the fundraising goal for 2015 based on the results from 2014. Continue to cultivate relationships with current donors and develop partnerships with new donors. Utilize Raiser’s Edge donor tracking system. WORK TO BE ACCOMPLISHED: Work closely with the Board of Directors’ Fund Development Committee. Develop new strategies for reaching out to individual donors in the community. Cultivate and maintain current relationships Keep accurate records of communication with current and potential donors, using Raiser’s Edge. HOW THE COUNCIL WILL KNOW IT HAS BEEN SUCCESSFUL IN 2015:  he Council will continue to increase its donor base, its contact list, and have increased contributions from T individual donors. 2016 GOALS: The dollar goal will be determined based on the 2015 fundraising totals. Increase donor and potential donor contacts. The Council will have a comprehensive and proven plan for community and donor engagement in place. WORK TO BE ACCOMPLISHED: Work closely with the Board of Directors’ Fund Development Committee. Evaluate the methods for individual engagement and make alterations where needed. Continue to develop and maintain relationships established from the previous two years. HOW THE COUNCIL WILL KNOW IT HAS BEEN SUCCESSFUL IN 2016:  rom 2014 to 2016 the Council will establish a donor base, an effective management system, and F increased funding from individual donors. Empire. The Council also does not have any additional sources of revenue from outside organizations to assist with programming or establishing cross-promotional opportunities that would be beneficial to both organizations. FUTURE STATE: The Council will have strong relationships with funders and increase foundation and corporate contributions. The Council will continue to build relationships that will assist in facilitating programs and opportunities for our members. 2014 GOALS: Obtain corporate and grant funding for program, membership, camp, and event needs. WORK TO BE ACCOMPLISHED: Work closely with the Board of Directorsâ&#x20AC;&#x2122; Fund Development Committee. Develop a formal case statement for giving. Develop a process for identifying funding needs for programs membership, camps, and events. Develop a corporate recognition program. Develop a communications plan for grantors and corporate funders.  evelop a corporate media packet that details the need for support and what the Girl Scouts do in the D community to benefit the lives of young girls. Develop an annual event calendar. Complete grant and corporate funding applications. HOW THE COUNCIL WILL KNOW IT HAS BEEN SUCCESSFUL IN 2014: Council will have identified corporate funders in the Inland Empire and begin to establish relationships. The Fund Development Department will have a process to identify the funding needs of the Council.  und Development will have created the needed communication and marketing materials to reach out to F corporate funders. The Council will increase grant and corporate funding from its 2013 total. 2015 GOALS: Continue to develop funder relationships. Complete grant and corporate funding applications. WORK TO BE ACCOMPLISHED IN 2015: Work closely with the Board of Directorsâ&#x20AC;&#x2122; Fund Development Committee.  valuate strategies established in 2014 and determine their effectiveness in establishing and cultivating E relationships with funders. Determine the funding needs for the Council for the 2015 membership year. Update communication components. HOW THE COUNCIL WILL KNOW IT HAS BEEN SUCCESSFUL IN 2015: Current relationships will be fostered and will result in increased funding. There will be an increase in the number of relationships from 2014. Overall funding will exceed the 2014 amount. 2016 GOALS: Corporate funder relationships are fully established. Seek out and complete more grant and corporate funding applications. WORK TO BE ACCOMPLISHED: Work closely with the Board of Directors’ Fund Development Committee. Determine funding needs for the Council for the 2016 membership year. Maintain existing donor relationships. Continue to establish new relationships. Seek out additional funding. Update communication materials for 2016. HOW THE COUNCIL WILL KNOW IT HAS BEEN SUCCESSFUL IN 2016: Grant and corporate funding will increase steadily over the previous three years. Relationships will be established and fostered—resulting in increased partnerships. GIVING CAMPAIGNS CURRENT STATE: Currently, the Council conducts a Board giving campaign, employee giving campaign, and Share Family Partnership campaign. The Council needs to implement additional campaigns; workplace giving, planned giving, major gifts; and capital campaign to increase revenue. The Council also needs to revamp the Share Family Partnership to attract more potential donors. additional programs designed to raise more funds to support all the functions of Girl Scouts and program delivery. 2014 GOALS: Promote donating through workplace giving campaigns to corporations and other agencies. Develop relationships leading to major gifts and planned giving. WORK TO BE ACCOMPLISHED: Work closely with the Board of Directors’ Fund Development Committee.  romote the Girl Scouts of San Gorgonio Council and its programs throughout the community and P educate community members the Council’s need for donor support. Develop a donor recognition program. Promote volunteer opportunities to engage community members with the Girl Scouts. Incorporate giving messaging into all communications. Develop a communications plan to foster relationships leading to major gifts and planned gifts. HOW THE COUNCIL WILL KNOW IT HAS BEEN SUCCESSFUL IN 2014: The Council will generate additional funding through workplace campaigns. The Council will have 20 donors contributing $1,000 or more annually. The Council will have 10 planned gifts or viable prospects. 2015 GOALS: Continue to increase donations through workplace giving, major gifts, and planned gifts. WORK TO BE ACCOMPLISHED: Work closely with the Board of Directorsâ&#x20AC;&#x2122; Fund Development Committee. Determine more effective ways to reach out to the community and potential donors. Evaluate and improve the donor recognition program. Continue to manage and develop new donor relationships. Evaluate the messaging and communication plan used to foster relationships. HOW THE COUNCIL WILL KNOW IT HAS BEEN SUCCESSFUL IN 2015: Funding will increase from 2014. Funding will increase through the Councils giving campaigns. The Council will increase donors contributing $1,000 annually.  he Council will cultivate the relationships established with planned giving prospects and foster T relationships with more individuals. 2016 GOALS: Continue relationship management. Consider a capital campaign for camp improvements. WORK TO BE ACCOMPLISHED: Work closely with the Board of Directorsâ&#x20AC;&#x2122; Fund Development Committee. Evaluate strategies for reaching out to the community. Evaluate the donor recognition program. Continue to manage and develop new donor relationships. Update the messaging and communication plan. Develop a capital campaign prospectus. HOW THE COUNCIL WILL KNOW IT HAS BEEN SUCCESSFUL IN 2016:  he Council will have established a diversified revenue stream and can become more reliant on its donor T base. COMMUNITY VISIBILITY ESTABLISH BETTER RELATIONSHIPS WITH LOCAL MEDIA OUTLETS THAT COVER THE AREAS WITHIN THE SAN GORGONIO COUNCIL. process for reviewing and maintaining lists and contact relationships is in place. There is no structured distribution calendar. A process needs to be established in order to identify and create new relationships, which will support the Councilâ&#x20AC;&#x2122;s efforts to expand its community visibility. quarterly. Beneficial media relationships will be established and aid in the Councilâ&#x20AC;&#x2122;s efforts to raise the visibility and value of Girl Scouting. 2014 GOALS:  ompile a list of media contacts from each region so that the Council can have media representation in C every region. Make personal contact with existing and new media contacts. WORK TO BE ACCOMPLISHED:  evelop a database for tracking media contact information. (e.g., name, media outlet, media type, D phone, address, email, website, last day of contact) Start compiling the master list of media outlets with contact information available in the service areas.  uild current relationships and establish new partnerships with each media lead discovered via telephone B introductions, emails, and personal introductions. Send out Marketing Kits (e.g., Girl Scout promotional items) to targeted media outlets. Implement a thank-you card schedule, which will be tracked in the database. HOW THE COUNCIL WILL KNOW IT HAS BEEN SUCCESSFUL IN 2014:  unctioning database of media contacts in each region will be established, with personal contact F established with 50% of the entities listed.  arketing Kits will be distributed to all responsive entities the first year. Frequency will be determined by M responsiveness, event attendance, and coverage given to GSSGC. Thank-You notes will be distributed with the same frequency plan as Marketing Kits. 2015 GOALS: Expand and update the media contact list.  ake personal contact with those on the list not contacted in 2014 and with newly developed media M contacts. Conduct an annual press event to support media relations. WORK TO BE ACCOMPLISHED: Establish a quarterly database review to update information and assess responsiveness of media contacts. Maintain current relationships with media contacts via targeted correspondence.  stablish personal contact with new media leads discovered via telephone introductions, emails, and E personal introductions.  evelop and execute event goals for the first annual press event. The event should be centered on a D reportable item. Continue sending out Marketing Kits and Thank-You cards. HOW THE COUNCIL WILL KNOW IT HAS BEEN SUCCESSFUL IN 2015: 10% increase over 2014 in personal contact with media representatives or outlets in each region.  arketing Kits will continue to be distributed to all responsive entities, as well as new contacts established. M Frequency will be determined by responsiveness, event attendance, and coverage given to Girl Scouts of San Gorgonio. Thank-You cards will be distributed on the same frequency plan as Marketing Kits. Press event success will be indicated by attendance and media coverage. 2016 GOALS: Expand and update media contact list.  ake personal contact with those on the list not contacted in 2015 and with newly developed media M contacts. Evaluate press event success and plan additional event(s) if warranted. WORK TO BE ACCOMPLISHED: Review and update database and assess responsiveness of media contacts. Maintain current relationships with media contacts via targeted correspondence.  stablish personal contact with new media leads discovered via telephone introductions, emails, and E personal introductions. Assess success of press event and determine if continuance is warranted. If determined successful, continue sending out Marketing Kits and Thank-You cards. HOW THE COUNCIL WILL KNOW IT HAS BEEN SUCCESSFUL IN 2016: 10% increase over 2015 of personal contact with media representatives or outlets in each region.  arketing Kits will continue to be distributed to all responsive entities, as well as new contacts established. M Frequency will be determined by responsiveness, event attendance, and coverage given to GSSGC. Thank-You notes will be on the same frequency plan as Marketing Kits. Press event success will be measured by quantity of media coverage (PAs, cover stories, etc). publication, with little to no story leads provided by volunteers and girl members. With no structure to funnel stories from the troop level to Council, many of the stories that are important are getting overlooked. These stories aid in expanding public perception of what a Girl Scout is, help build membership, and bring the Girl Scouts of San Gorgonio Council to the front of donorsâ&#x20AC;&#x2122; minds. FUTURE STATE: The Council will have a functional Girl Reporter Program to funnel stories and leads to Council. The Council will also have a functional system for delivering story leads and news opportunities to Council from girls and volunteers. Utilizing these stories, the organization will expand Girl Scout brand identification and the publicâ&#x20AC;&#x2122;s knowledge of the Girl Scout Leadership Experience (GSLE) in the San Gorgonio jurisdiction. 2014 GOALS: Develop a Volunteer Media Position. Create Council story submission structure and begin implementation. Develop and begin implementation of girl reporter internship. Structure Public Service Announcement (PSA) requests and explore feasibility. WORK TO BE ACCOMPLISHED IN 2014: Develop a Volunteer Media Position in each region.  esignate an interdepartmental staff reporting structure for volunteers to filter media-worthy stories to D Council. Develop media training for the Volunteer Media Position.  esignate key Public Relations (P.R.) and Membership Department staff to communicate and support the D Volunteer Media Position. Develop a web-based story submission form. Establish a story approval process for the Public Relations function. Develop the Girl Reporter Program. Establish a curriculum and training process for the Girl Reporter Program. Create a Council support structure for the Girl Reporter Program. Create a GSSGC Blog specifically geared towards publishing all approved Girl Reporter stories. HOW THE COUNCIL WILL KNOW IT HAS BEEN SUCCESSFUL IN 2014:  uccess for the Volunteer Media Position will be indicated by having a structure, position description and S training materials in place to begin implementation in 2015. Additionally, the Volunteer Department will assist in developing a list of candidates to fill the new Volunteer Media Position.  uccess for the story submission process will be indicated by having a form developed and rolled out to S the limited audience of Council staff and volunteers via our social media channels.  uccess for the Girl Reporter Program will be indicated by having a girl intern in place and trained in each S region.  dditional markers for success will include having at least one story developed, written, and published A (either via blog or traditional media outlets) by each girl by the end of 2014.  uccess of the PSAs will be reflected by having a submission structure fully in place and having a cost S breakdown of technology needed to accomplish production of PSAs at Council. 2015 GOALS: Fill and train Volunteer Media positions. Further implement story submission process. Continue the Girl Reporter Program and implement reporter programming for older girls. Begin producing and distributing PSAs to relevant media outlets. WORK TO BE ACCOMPLISHED: Fill Volunteer Media positions. Train the recruits for the new Volunteer Media positions. Roll out the Story Submission Form for use by the Volunteer Media people. Support the Volunteer Media people. Establish a Girl Reporter Program for older girls. Continue the Girl Reporter Internship. Maintain Girl Reporter Blog as needed. Begin posting to the Girl Reporter Blog regularly at an interval of two stories per month. Increase the number of girl-developed and written stories submitted to traditional media outlets. Quantity per region should reflect balanced coverage determined by the percentage of membership per region. Develop and produce PSAs at Council level. Distribute PSAs to appropriate media outlets. HOW THE COUNCIL WILL KNOW IT HAS BEEN SUCCESSFUL IN 2015:  uccess for the Volunteer Media Position will be indicated by having all positions filled and trained for S each region.  tory submissions and leads from the Volunteer Media people should reflect a 25% success rate for S publication.  uccess for the Story Submission Form will be indicated by having a form that generates at least 3 leads a S month. Success for the Girl Reporter Program will be indicated by continuing to have a girl intern for each region. Girl-generated story publications will increase by 30% over 2014. Success for PSAs will be indicated by developing and producing two PSAs in 2015. 2016 GOALS: Maintain the Volunteer Media Position and fill as needed. Continue the story submission process. Continue the Girl Reporter Program for older girls. Continue producing and distributing PSAs to appropriate media outlets. WORK TO BE ACCOMPLISHED: Fill the Volunteer Media Position, as needed, and provide training. Continue to utilize, maintain, and promote (via social media) the Story Submission Form. Support the Volunteer Media Position. Continue the Girl Reporter Program. Maintain the Girl Reporter Blog as needed. Post to the Girl Reporter Blog every story that is developed, written, and approved. Increase the number of girl-developed and written stories submitted to traditional media outlets. Quantity per region should reflect balanced coverage determined by the percentage of membership per region and a 10% increase over 2015. Develop and produce PSAs at Council level. Distribute PSAs to appropriate media outlets. HOW THE COUNCIL WILL KNOW IT HAS BEEN SUCCESSFUL IN 2016:  uccess for the Volunteer Media Position will be indicated by having all positions filled and trained for S each region.  tory submissions and leads from the Volunteer Media people should reflect a 35% success rate for S publication.  uccess for the Story Submission Form will be indicated by having a form that generates at least 5 leads a S month. Success for the Girl Reporter Program will be indicated by continuing to have a girl intern for each region. Girl-generated story publication will increase by 10% over 2015. Success for PSAs will be indicated by developing and producing three PSAâ&#x20AC;&#x2122;s in 2016. COMMUNITY CHAMPIONS PROGRAM CURRENT STATE: San Gorgonio staff wants to work within communities that have so far been untouched by the Girl Scout Movement. It has been difficult to become a trusted voice within a community. FUTURE STATE: Staff will work alongside volunteers assigned as Community Champions, with set duties and materials at hand to spread the Girl Scout message. There are many, communities within which it is virtually impossible for Girl Scout staff to become trusted voices. These carefully selected volunteer Community Champions would already be familiar with, and part of, these communities. 2014 GOALS: Create guidelines and structure for a Community Champion volunteer position. Identify potential Community Champions based on the volunteer database, which will be developed by the Volunteer Department. WORK TO BE ACCOMPLISHED:  evelop a volunteer position including duties and goals for targeted communities: Community D Champions.  ssign a staff member from the Membership Department to oversee that the correct message is being A conveyed to potential members. Identify what communities are the targets for the Council and find volunteers who have a connection to those communities. HOW THE COUNCIL WILL KNOW IT HAS BEEN SUCCESSFUL IN 2014:  he Council will have a written structure approved by management dictating the Community Championâ&#x20AC;&#x2122;s T responsibilities and guidelines.  here will be a list of potential volunteers who are integrated into the communities targeted for outreach T and who are candidates to be Community Champions. 2015 GOALS: Create kits with proper message items. Assign monthly newsletters about ongoing Girl Scout activities and news. Recruit Community Champions in each region as needed. WORK TO BE ACCOMPLISHED:  reate kits that include appropriate materials to spread the Girl Scout word, such as alumnae cards, C multilingual materials and verbiage, name tags, business cards, etc.  ach region will update its portion of the San Gorgonio website and content will be printed as needed for E the Community Champions to distribute.  ach region will assign Community Champions to the communities where outreach challenges have been E encountered in the past. HOW THE COUNCIL WILL KNOW IT HAS BEEN SUCCESSFUL IN 2015: Every region will have one Community Champion in targeted communities.  ach Community Champion will have available to them the kits with the resources they need to correctly E inform the public about what Girl Scouts can offer. 2016 GOALS: Have an established group of Community Champions within Council. Continue providing kits for Community Champions. WORK TO BE ACCOMPLISHED: Expand the Councilâ&#x20AC;&#x2122;s established group of Community Champions.  ontinue building kits for the Community Champions to correct any misconceptions about the Girl C Scouting program. HOW THE COUNCIL WILL KNOW IT HAS BEEN SUCCESSFUL IN 2016:  here will be a 1% increase in membership throughout Council from communities that were not reached in T the past. programs in our area. Although there is a paucity of companies headquartered in our area, only some banks, retail stores, and other businesses have been approached for supportâ&#x20AC;&#x201D;let alone been engaged with GSSGC as partners. employing over 100 people or with annual revenue exceeding $10 million. San Gorgonio will be partnering with the Community Foundation, the philanthropic arm of every Indian tribe in our area, and with every private foundation in Riverside and San Bernardino counties that focuses on children and youth. 2014 GOALS:  egin to acquire fund development leads from Chambers of Commerce, GSSGC Membership Managers, B and members of the San Gorgonio Alumnae Association.  eceive invitations to speak about Girl Scouts in front of at least two service organizations (e.g., R Soroptimist, Rotary, and Lions Club) in each region. WORK TO BE ACCOMPLISHED:  aintain an active membership and attend meetings regularly at Chambers of Commerce, with a minimum M of two chambers in each of the five regions.  und Development will work with Membership Managers in each region to acquire leads among F businesses and local philanthropists.  und Development will train Membership Managers and volunteers in ways to raise visibility of Girl Scouts F in their communities.  ultivate members of the Alumnae Association and begin to convert them to involved volunteers and C regular donors.  peak about Girl Scouts and their need for support before service clubs and organizations in every Council S region. HOW THE COUNCIL WILL KNOW IT HAS BEEN SUCCESSFUL IN 2014:  ecords will be maintained in Raiserâ&#x20AC;&#x2122;s Edge for corporate donors, foundations, alumnae, other individual R donors, and service clubs with detailed profiles and records of contacts, visits, and communications. 2015 GOALS:  he Council will use its memberships with local Chambers of Commerce to build relationships with other T members who can support the Girl Scouts. Membership Managers will function as extensions of the Fund Development staff as an additional duty. The San Gorgonio Alumnae Association will play an active role in philanthropy. At least ten service organizations will support the Council. WORK TO BE ACCOMPLISHED: Evaluate the results from 2014.  und Development will continue to expand and deepen its relationships and partnerships with agencies, F businesses and individuals that exhibit the potential to support the Council.  he Alumnae Association will become a philanthropic arm of the San Gorgonio Council, as well as a T vehicle to provide volunteer support for Girl Scout programming. Create a more robust database of information in Raiserâ&#x20AC;&#x2122;s Edge for donors and potential donors. Write and submit grants to a wide range of corporate and foundation funding sources. HOW THE COUNCIL WILL KNOW IT HAS BEEN SUCCESSFUL IN 2015:  he Fund Development Department will continue to develop and establish relationships with agencies T that have the potential to support the Girl Scouts of San Gorgonio Council.  ew partnerships will be sought and established with the help of every department with the Council and N with the help of the Alumnae Association. The Council will receive support through grants. Efforts should increase contributions from 2014. 2016 GOALS:  ost of the potential funding sources in the Council area will be identified and relationships will be M cultivated. WORK TO BE ACCOMPLISHED: Evaluate the results from 2015. Continue to cultivate relationships with agencies and seek contributions. Write and submit grants to a wide range of corporate and foundation funding sources. Further work will be determined by the results from 2014 and 2015. HOW THE COUNCIL WILL KNOW IT HAS BEEN SUCCESSFUL IN 2016: Raiserâ&#x20AC;&#x2122;s Edge will be populated with detailed records of contacts, visits, and communications. Relationships with community partners will be well established. The amount of grants received will increase. Contributions to the Council will have progressively increased from 2014 and 2015. MULTILINGUAL COMMUNICATIONS CURRENT STATE: A limited amount of translated resources are available to accommodate new members who are non-English speaking. FUTURE STATE: The Council should have written materials, trainings, website and programs available in multiple languages tailored to different cultures. 2014 GOALS: External Relations and Membership to work collaboratively to develop tailored communication.  embership to identify multilingual material needs and develop a plan for Spanish language volunteer M engagement and program delivery. WORK TO BE ACCOMPLISHED: Establish consistent Council-wide messaging based on the GSLE. Identify what types of materials are needed to reflect membership needs. Develop plan for culturally relevant, Spanish language marketing materials. HOW THE COUNCIL WILL KNOW IT HAS BEEN SUCCESSFUL IN 2014: A concise Council-wide message will be determined. A plan on how to spread the message to Spanish speaking families will be determined. 2015 GOALS: Continue to spread consistent Council-wide messaging based on the GSLE. Design marketing materials and trainings to reflect language needs. Utilize culturally relevant, Spanish language marketing materials. WORK TO BE ACCOMPLISHED: Continue to spread consistent Council-wide messaging based on the GSLE.  esign informative materials in Spanish including events, product sales, marketing materials on D membership initiatives, trainings and programs. HOW THE COUNCIL WILL KNOW IT HAS BEEN SUCCESSFUL IN 2015: 50% of the informative materials for membership, events and product sales will be translated into Spanish. The Council will offer Basic Leadership Training for Spanish speaking parents and volunteers. 2016 GOALS: Continue to spread consistent Council-wide messaging based on the GSLE. Continue to provide marketing materials and training to reflect membership language needs. Determine if a third language is needed and financially feasible. WORK TO BE ACCOMPLISHED: Review and update marketing materials and training in Spanish. Continue producing materials for events, trainings and membership initiatives in Spanish. Determine if there is a need for materials in languages other than Spanish and English. HOW THE COUNCIL WILL KNOW IT HAS BEEN SUCCESSFUL IN 2016:  00% of the informative materials for events, membership, and product sales will be translated into 1 Spanish. Along with Basic Leadership Training, there will be First Aid/CPR Training offered for Spanish-speaking parents and volunteers. THE PROGRESS TOWARD ACHIEVING EACH METRIC. VICE PRESIDENT OF FUND DEVELOPMENT, EXTERNAL RELATIONS, MARKETING AND I.T. Cynthia H. Breunig became President and CEO of the Girl Scouts of San Gorgonio Council in 2011. She was a 10-year Mariner Scout and is a Lifetime member of Girl Scouts. Encompassing Riverside and San Bernardino counties, the council supports 12,000 Girl Scouts and 5,000 volunteers. Under Cynthia’s leadership, the council increased membership by over 20%; is first in the nation in Girl Scout cookie sales; and has taken the lead nationally in reaching out to girls from low income families and Hispanic communities, with programs that build girls of courage, confidence and character. Cynthia served for 13 years as President and CEO of Inner-City Arts, a nonprofit center providing art instruction to 10,000 children in the heart of Los Angeles’ Skid Row. Cynthia enjoyed a 25-year career in museum management, opening what is today the Autry National Center in 1988. Cynthia serves on the board of the Cabot’s Pueblo Museum, is an Annenberg Alchemy Community Champion, and was recently named an Academy Fellow for the City Scholars® Leadership Academy. Cynthia received a Bachelor’s in Art History, holds advanced degrees in Museum Studies and Education Administration, and attended Stanford University’s Graduate School of Business Executive Education Program. Nancy Perdue joined GSSGC as its CFO in July 2006, where she has successfully imposed stringent financial controls and implemented the Financial Edge enterprise accounting system. Under her direction, the Council’s financial performance has been recognized with excellent findings from independent audits. During her long career in finance, Nancy has managed financial accounting operations for manufacturing and distribution companies, before moving to the nonprofit sector 13 years ago. A native of rural Minnesota, she studied financial accounting at the University of Minnesota and then at the University of Redlands, where she graduated with a degree in management and a concentration in accounting. A Lifetime member of Girl Scouts, Nancy has a granddaughter who is active in Girl Scout Junior Troop 314 in Highland, California. Elizabeth Locke-Thomas joined GSSGC five years ago, after years of service as a volunteer for this Council. She presides over a product and retail sales organization that has flourished under her leadership. Year-overyear increases in cookie sales have reached as high as 42%, increasing the cookie sale by over $4 million in five years and taking the Council per girl-average from 155 boxes to a national high of 328 boxes in 2014. The retail department tops the nation in performance, with its cutting edge merchandise. A hospitality professional with 30 plus years of experience, Elizabeth was Director of Food and Beverage for 4 Diamond properties and owned her own successful catering business. A veteran of service with the Israel Defense Forces, she is a graduate of Johnson and Wales University with a Degree in Hospitality Management and Culinary Arts, and has served on several task forces for Girl Scouts of the USA. Chuck MacKinnon, Vice President of Fund Development & External Relations for Girl Scouts of San Gorgonio, embarked on his nonprofit career in 2004 after retiring as Senior Director for Worldwide Administration at Herbalife International. In a varied career, he has also been a writer, editor, project manager, business analyst, and department head of a 100-person information technology department. Before joining Girl Scouts in 2011, Chuck worked with House of Hope Foundation and Inner-City Arts in Los Angeles. A Vietnam veteran and former Army Medical Service Corps officer, he graduated from Boston University with a degree in English and completed extensive graduate level coursework in business administration. Chuck is a Lifetime Girl Scout. A Girl Scout veteran, Linda came to GSSGC in 2011 from the Greater Los Angeles Council. She has over 16 years in management for membership departments in the San Diego-Imperial, Golden Valley, Spanish Trails, Greater Los Angeles and San Gorgonio councils. She has demonstrated success in community development and partnerships that offer Girl Scout opportunities to all girls. Proven service to underserved girls has been instrumental in the attainment of several grants, throughout the various Councils, as a building block. With a focus on connecting socio-economically challenged communities to Girl Scouting, Linda has served as a board director for several organizations focused on at-risk-youth and adult women development. Her passion for outreach to underserved girls has been instrumental in the attainment of several grants that have represented building blocks for the development of sustainable troop programs in socio-economic challenged areas. Linda is the recipient of a fellowship with The Gallup Organization, where she acquired skills she utilizes in her interactions with staff and the communities she serves.